Lines from Linderhof: Soon It Shall Be Goodbye . . .
We don't have a lot of these little fellows that visit the feeders at Linderhof but enough that bring smiles to our faces as we sit in the breakfast room with our morning coffee, afternoon tea, or evening computer. We have one brazen fellow who, flies right up to the window, hovers and stares. When he comes for his "visit", I know that I am totally out of food in the feeder. He's the only one brave enough to tell me that "hey, it's time to fill the feeder -- I'm hungry and there isn't anything there"! Soon they will begin their long trek south -- to Mexico. Usually around October 1, we pull our feeders as the birds have started their long migration. We look forward to their return in the spring. It's Wednesday, which means that it's Outdoor Wednesday so please join Susan at A Southern Daydreamer . Outdoor Wednesday is always fun! I keep trying to get a picture of a hummingbird and have yet to achieve it! Great capture! I've never seen a hummingbird in NYC but I've seen them out west and really enjoy watching them. I collect little hummingbird trinkets ... I can't resist. How great that you have one keeping tabs on the feeder for you. I love hummingbirds, but never see any around here. They must be more native elsewhere. Wonderful photo! Only another week or so of summer and then time to enjoy autumn before the winter winds start to blow snow. I'm looking forward to both seasons. 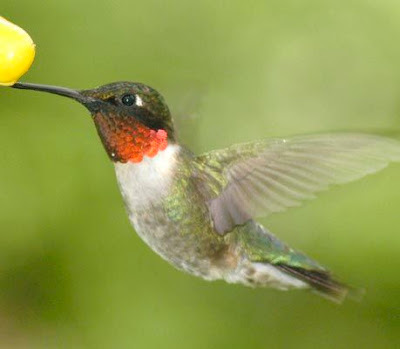 At this current house we get TONS of these, and they are feeding like crazy - - - a real feeding frenzy - - - so we assume they are storing up (can hummingbirds store up?) for their long trek south. How wonderful! I love the brazen one! Great idea to post a hummingbird photo because soon they will be making the long, long trip to Mexico. Aren't they interesting to watch? We had a little guy in NY who would fly right in front of our faces- not shy at all! Great picture! I only had 4 hummers at my feeder this year. I hate to see their season pass! Trying to keep the feeders full as they have a long journey to travel. Awww! Hummers are so cute!!! My sister lives in a wooded area and she gets lots of them at her feeders. I never see any where I live, but then again, we don't have much "cover" in our yard and we live in a very urban area. Someday I hope to attract some to our yard! Some of those little fellows stay year round by the ponds, so we keep our feeders and water containers full and thawed for them. Yes they are lovely! This is 2nd attempt here at a note! I have had one very early in the morning. I was especially amuzed at the buzzing sound they make! What a great shot of the humming bird. I do not have any at my home here in Florida, but I had a lot of them when I lived in Texas. I loved to sit on the porch and watch them. I so love those little ones! What a great photo!!! We have many hummingbirds in my yard too....some of them stay all year here. I guess we are close eough to Mexico for them! Love the picture!! I finally bought a feeder about a month ago--and we promptly saw 2 birds a couple days apart. Sadly, I haven't seen any since--but we are enjoying monarch migration through our gardens--they especially love the blue mist spirea! Such sweet little creatures God blesses us with! How much I wish you will get that teapot in the Wedgwood Cuckoo pattern! Very thankful for your reference to our 9/11 shared past, very thankful that your hubby sang the national anthem in remembrance of that meaningful, shared date.